Five refugee resettlement experts with experience in Canada's past and present programs will participate in a panel discussion examining the past, present and future of Canada's refugee resettlement efforts. The public is invited to attend the event, titled, "Refugee Resettlement in Canada: Moving Forward from Lessons of the Past." 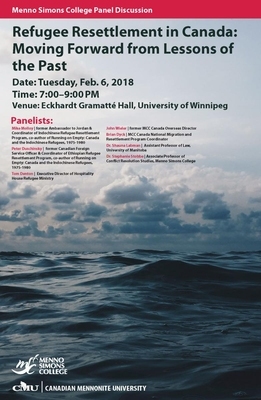 The discussion will take place on Tuesday, February 6 at 7:00 PM in Eckhardt Gramatte Hall, at the University of Winnipeg. Admission is free, and all are welcome.